(Sept. 27, 2004, Vancouver, B.C.) 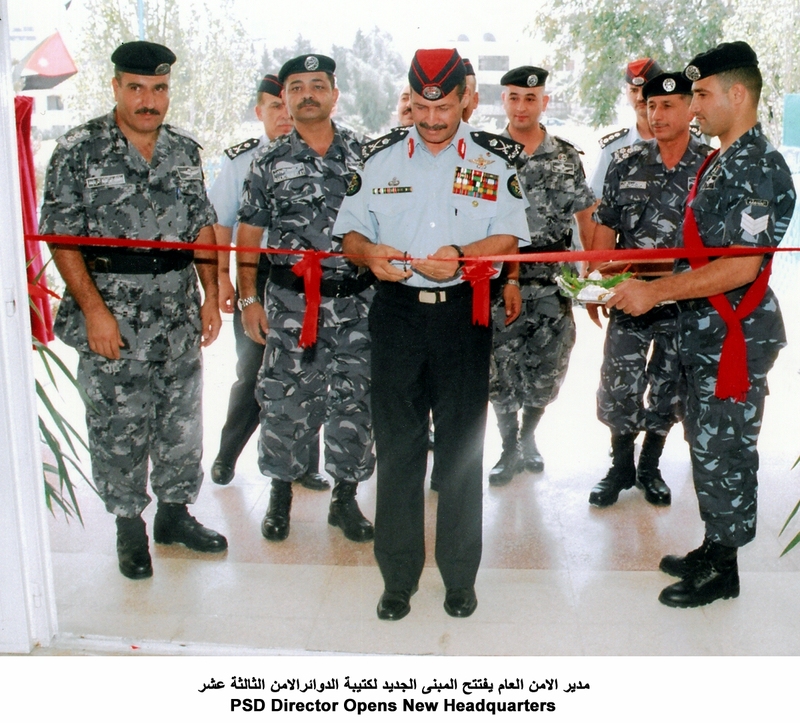 His Majesty King Abdullah II of Jordan recently announced to HyperStealth through His Military Office that the PSD Digital Urban camouflage exclusive to the Jordan's Security Forces would only be issued as the stock pile of older traditional camouflage uniforms was used up. The photo on the left, taken today shows two of the "KA2" digital patterned uniforms along with two older versions of the Public Security Directorate (PSD) camouflage. The photo shows how the digital effect (far left) creates a background noise while the traditional DPM Grey pattern (2nd from left) is much more defined. The digital effect in objective testing is much more difficult to recognize when the focal region of the human eye is looking directly at the pattern. The second shade of gray in the digital pattern is lighter than the second shade in the older DPM as the buildings and structures in Jordan are lighter than the traditional DPM color scheme. The two DPM camouflage uniforms on the right are slightly different with darker gray and some blue. The new Uniform cut and style was designed by guidelines from his Majesty with input from the Military and executed by the Military Office. 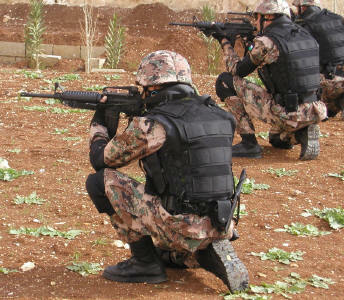 Certain features from the current Jordan Armed Forces uniform were combined with the best features from the U.S. Army BDU, U.S. Marine Corp MARPAT and British DPM uniforms. Current KA2 patterns include 6 different color schemes which include Land Forces / Air Force Desert Digital. Royal Guard Arid/Woodland Digital, Special Forces Woodland Digital, Coast Guard / Navy Deep Blue Digital, Public Security Directorate Urban Digital, Civil Defence Directorate Blue Urban Digital. 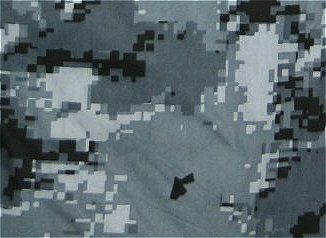 This includes all services in Jordan; all units from the Jordan Armed Forces and Law Enforcement and Civil Defence Directorate have adopted the KA2 pattern as their official Battle Dress Pattern (BDP). 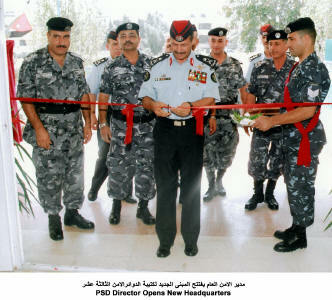 Jordan's Digital desert was designed with colors that blend with Jordan's darker deserts (below), Jordan's Counter Terrorism Battalion in this older photo when the digital uniforms were first issued are shown in their old black vest, knee and elbow pads, boots and gun. The Kingdom of Jordan is working on developing full soldier camouflage for most of their equipment as can be seen on the actual coated PSD Urban gun at the bottom. 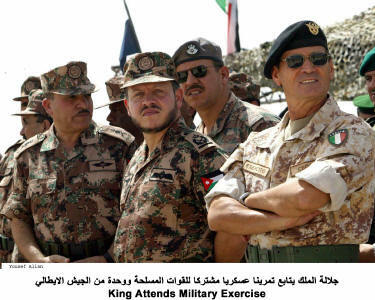 His Majesty King Abdullah II the Supreme Commander of the Jordan Armed Forces attended on Monday a joint military exercise that was performed by one of the units of the middle military zone with an Italian unit. The King was briefed, in the presence of HRH Prince Faisal Bin Al Hussein, the Chairman of the Joint Chiefs of Staff, and the Chairman of the Chiefs of Staff of Italy on the exercise and its stages. The exercise comes within frame of joint military exercises with brotherly and friendly countries with a view to exchange expertise. The digital pattern, designed by HyperStealth® has a few improvements over other North American digital designs with both the Macropattern and Micropattern elements allowing for better concealment at farther distances and simulated reflection and shadows elements. King Abdullah II is recognized as one of the most qualified world leaders in Military knowledge and understanding given his experience as a Armored Battalion Commander, Helicopter Attack Pilot, Commander of Jordan’s Special Forces and extensive schooling in both the elite British and United States military schools. His camouflage was designed to meet those high standards. Jordan continues to develop and expand their digital concealment programs with HyperStealth® for their Armed Forces. For information related to camouflage development, please contact HyperStealth® Biotechnology Corp., Guy Cramer, President/CEO directly at gcramer@hyperstealth.com or phone (604) 961-7046. For information related to camouflage development, please contact HyperStealth® Biotechnology Corp., directly at gcramer@hyperstealth.com or phone (604) 961-7046.